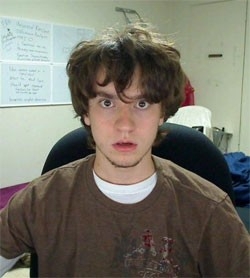 "20-something firmware magician GeoHot (George Hotz) has already been sued by Sony for jailbreaking the PlayStation 3, and caused a major stir in the iPhone dev community when he released limera1n. So what next for the ambitious young hacker? How about taking a stab at Windows Phone 7?" Despite temporarily taking down the Chevron WP7 tool that allowed sideloading of apps, Microsoft continues to be less than draconian about shutting out would-be hackers. In this instance, it's almost a dare to hacker GeoHot (mugshot above), with an offer of a free development device thrown in for good measure. I hope MS stays the course on this - I for one ain't that keen on the gated marketplace concept, especially since half the countries WP7 has been introduced in still have no official access to Windows Marketplace. Hrm. The adage of "Be careful what you wish for..." comes to mind. Hasn't MS always been fairly developer friendly? "Developer Friendly" and "Hacker Friendly" are two very different things IMO.